Masters In Counseling Salary: How Much Do Therapists Make? Graduate counseling programs provide the advanced clinical training necessary to move ahead in the mental health field. With a master’s degree in counseling, you can expect long-term career prospects with opportunities to advance your degree, your scope of practice, and your professional fulfillment. Below you’ll find a comprehensive overview of salary data for counselors in today’s job market. You’ll also find salary data for the most common areas of speciality in the counseling profession. What Is The Average Salary For Counselors? How Does Area Of Specialization Affect Salary? What Other Factors Affect Earning Potential? What Is The Career Outlook For Counselors? What Is The Earning Potential For Counselors In Private Practice? The average salary for counselors varies depending on your area of specialization, where you live, and the type of practice you work choose. (In some cases, counselors pursue various private practice options.) Salary is also determined by your level of education. In order to best determine your earning potential, you must first decide on an area of specialty. One of the many benefits of working as a counselor is the variety of specializations from which to choose. As you start to research degree programs, you’ll learn about the many of areas of specialization. These include marriage and family therapy, school counseling, substance abuse, trauma, and many others. In order to help you find salary statistics, we’ve listed a few of the most popular areas of specialization in the following sections, along with other useful information about your earning potential. The Bureau of Labor Statistics provides up-to-date salary data for many professions, including counselors. The BLS reports its findings on the most common types of counselors, such as substance abuse counselors, school and career counselors, behavioral health counselors, and mental health counselors. You’ll likely find in your research that counselors and therapists are terms often used interchangeably. This may lead to question whether therapists and counselors earn similar pay. Counselors and therapists are BOTH trained clinicians that provide a variety of support services for various challenges. Your credentials, however, are determined by the graduate counseling program. These credentials include Licensed Clinical Social Worker (LCSW), Licensed Professional Counselors (LPC), Licensed Mental Health Counselors (LMHC), Licensed Marital and Family Therapist (LMFT), and Licensed clinical professional counsellor (LCPC). There are also many organizations that provide guidance for standards of professional practice. These include The National Certified Counselor (NBCC), The National Association of Social Workers (NASW), The American Association for Marriage and Family Therapy (AAMFT), The American Mental Health Counselors Association (AMHCA), and The American Psychological Association (APA). Below you’ll find salary statistics for the most common types of counselors and/or therapists, including information on salary outlook and other important data. Jobs for educational, school, and vocational counselors are predicted to grow 13 percent from 2016 to 2026. The need for school and vocational counselors is on the rise due to a large number of retirees in the field and the growing need for on-site mental health and crisis intervention services. Additionally, more schools now hire counselors to address not only academic and vocational goals, but behavioral disorders as well. Demand for career counseling is projected to increase. Career counselors will be needed to help students at on onsite career. These centers are designed to help students transition into the workforce after graduation. If you enjoy working with students and helping them prepare for their futures, a career as a school counselors might be a good fit. Substance abuse and behavioral health counselors is projected to grow 23 percent from 2016 to 2026. As more addiction treatment centers and offender rehabilitation program programs develop, the need for qualified counselors will continue to increase. Substance abuse counselors can also find work at homeless shelters, colleges and universities, and hospital-based outpatient clinics. Keep in mind that private practices also employ substance abuse and behavioral health counselors. Salary varies by employer and size of their clinic. Substance abuse counselors often have a wide range of possible employment opportunities. This role requires specific training to treat clients with drug and/or alcohol addiction. With a 23 percent expected job growth, mental health counselors will have their pick of employment opportunities. Mental health counselors work in a variety of settings including clinics, schools, hospitals, agencies, human resource units, and private practice – all of which are in need of qualified therapists. Students in this field can specialize in a broad range of mental health issues, which widens the scope of job opportunities. Mental health counselors are also known by other titles since they are trained in rehabilitation and prevention. Make sure to read job descriptions carefully to see if you also qualify to work as a behavioral disorder counselor. Marriage and family therapists are on the high end of wages in the counseling field. In fact, the highest 10 percent in this field earned more than $70,830. A 29 percent job growth is expected from 2016 to 2026 due to an increased need for relationship counseling services. Graduates can also find employment in a new field of counseling that provides clinical services over the Internet called online counseling or virtual therapy. Some marriage and family therapists open their own practices after establishing successful relationships with clients. Counselors can then charge clients an hourly rate without contractual constraints. Rehabilitation counselors work in a diversity of settings, including vocational, medical, psychiatric centers, and correctional institutions. Jobs in this field are expected to grow by 13 percent, faster than the national average for other occupations. This is largely due to an aging population and the need for elderly care. Rehabilitation counselors can also play a consultant role by working with healthcare professionals to optimize patient therapy. Many more qualified rehabilitation counselors are needed now and in the foreseeable future. This field is becoming increasingly more diverse. Rehabilitation counselors are especially needed to address the mental and physical conditions of the elderly. Where you work as a counselor can have a big impact on how much you earn. Different parts of the country need more counselors than others, based on population, crime statistics, funding, community resources, and other factors. Location also plays an important part in licensing, continuing education, and insurance requirements, should you open your own practice. When considering location, don’t forget to factor in the cost of living. The cost of living in larger cities, such as New York or Chicago, is much higher than it is in smaller cities or towns. If you considering opening your own practice in a city with a higher cost of living, make sure you have the resources to do so. Gaining experience is an important step in the process of exploring your career options. Before you decide on an area of specialty, trying on different “hats” in the counseling field will help determine what kind of work environment, and patient population, is right for you. Volunteering at different organizations on the weekends or shadowing a counselor will help you gain hands-on experience and a possible foot in the door. The more experience you have, the more knowledge you have. And the more knowledge you have, the better you’ll be at counseling others. Each case is different and comes with its own unique set of circumstances and considerations. For counselors, this means professional growth and advancement opportunities. Continuing education opportunities are also great ways to expand your scope of practice. After a few years of working as a counselor, taking additional courses or attending a seminar can help improve your practice and possibly expand it to other services. Each state also has its own continuing education requirements. Psychologists in a private practice can often set their own hours and choose how many patients they want to work with, which affects their overall income as well. Counselors work in a variety of settings, depending on the services provided and the client populations. It’s important to consider the type of practice you wish to work for, as each setting provides a unique set of challenges and opportunities. For example, are there specific clients that interest you? Do you like working with couples, children, or do you prefer group therapy or one-on-one support? Do you want to work in a hospital or perhaps a shelter or women’s center? Where you work will not only determine your responsibilities but will also influence your pay. A master’s degree in counseling is often a requirement for many types of counseling jobs. With more clinical and academic training, you’ll be able to take new and exciting career challenges. Make sure to research the licensing requirements for counseling jobs in your state as each state has different practicing laws. Continuing education requirements also vary by state and will likely to be a necessary part of your job. These requirements are set forth by your state counseling board. Each state has it’s own counseling board. Check your state’s website for additional information about continuing education requirements. As population numbers rise, the demand for qualified counselors continues to grow. Counselors are needed to provide services in a number of different areas, including education, veteran services, substance abuse, marriage and family therapy, rehabilitation, just to name a few. 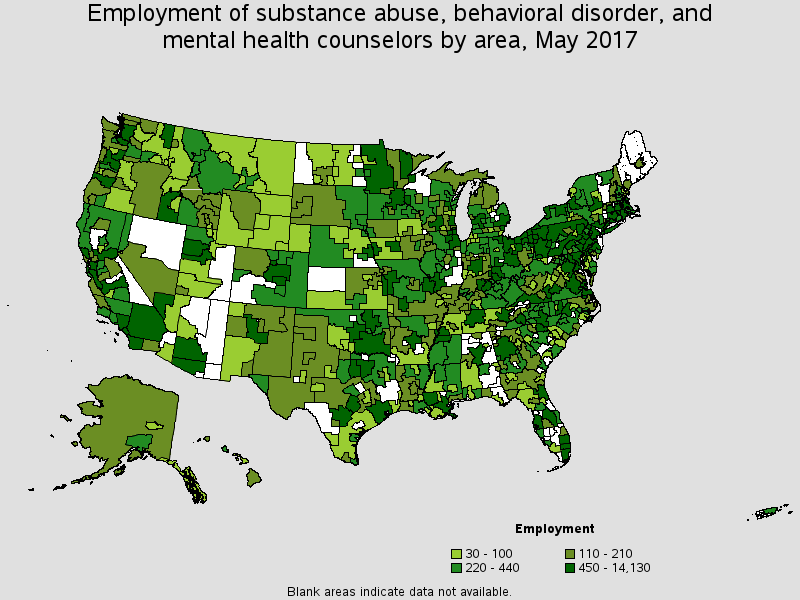 According to The Bureau of Labor Statistics, the career outlook for counselors is strong, specifically for substance abuse, behavioral disorder, and mental health counselors. The job outlook for marriage and family therapists is also strong. Employment of marriage and family therapists is projected to grow 23 percent from 2016 to 2026, much faster than the average for all occupations. Job outlook changes every year so it’s important to do your research to find reliable statistics. The BLS consistently updates its website with job outlook projections and salary data. Licensing Fees: Before you open your practice, you’ll need to research the laws in your state. There are specific laws for owning your business. You’ll likely have to obtain a business license from the city you live in and renew it annually. Overhead: Some of the expenses needed to operate a private practice include: office space; the cost of utilities and furnishings, office supplies, additional staff, if necessary, and the price of medical, dental, and liability insurance. It’s also important to keep in mind that your client base will not always be consistent. You’ll likely experience and ebb and flow in your work. While this is common in the counseling profession, for those clinicians in private practice, your income will not be consistent. However, with more experience comes a higher hourly rate. This may allow you to see fewer clients, while still supporting your own business. You might want to consider joining a professional organization or two. By becoming a member of these associations, there’s a chance you’ll connect with more potential clients. (If you’re moving into private practice, you might already have additional certifications and memberships from previous place(s) of employment. The risks associated with private practice are not for everyone. That’s why it’s important to know the facts. It may be helpful to talk to a fellow clinician in private practice to learn more about the pros and cons. Fluctuating income can be challenging for counselors who have other expenses. However, if you’re willing to put in the work and have the resources to do so, private practice can be incredibly rewarding. Our list of accredited schools will set you on the right path towards a rewarding career in the counseling profession.